You can open a command prompt in the directory that you are currently in by right-clicking on any empty screen space in the directory. This eliminates the need to navigate up a level in order to open a command prompt in the current directory, which was one of the biggest shortcomings of Microsoft's Open Command Window Here PowerToy. You can also open multiple command prompts by selecting a group of directories and invoking the command prompt. On versions of Windows that have UAC (Windows Vista, Windows 7, etc. 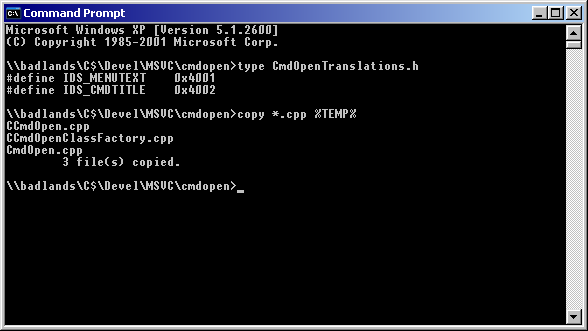 ), the ContextConsole Shell Extension can be used to open elevated command prompts. Compared to similar shell extensions, the ContextConsole Shell Extension has an extremely small memory and disk footprint (the 32-bit version consumes less than 16 KiB of disk space). The ContextConsole Shell Extension is open-source, licensed under a BSD-style license, so that anyone with some knowledge of C can easily build their own customized version of this shell extension. The user interface text has been translated into many languages, so that it will blend in seamlessly with most systems. Additionally, this shell extension is natively Unicode and can thus support a wide range of directory names. Both x86-32 and x86-64 systems are natively supported, so you can use this with the increasingly common 64-bit versions of Windows. You can even open directories from network paths (UNC paths). If you would like to contribute a translation, please translate and submit this file. If you would like to suggest a correction to an existing translation, please file a bug. Page last modified on 2011/03/09.